Tullynore Mission Hall, Hillsborough. 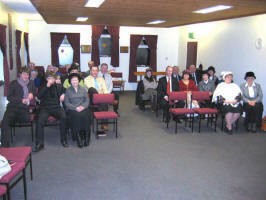 Some of the people that meet for worship at Tullynore Mission Hall. Established in 1950, the work at Tullynore has never actually been based in the townland of Tullynore. The name was taken from it’s first home, Tullynore Orange Hall which is in Drumlough on the Dromara Road almost equal distance between Hillsborough and Dromara. 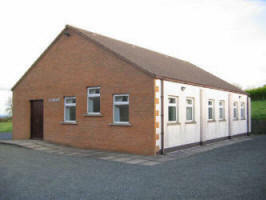 Based in the Orange Hall for some 17 years, a new hall was opened in 1967 adjacent to the Orange Hall. This property was built using an old prefabricated building that had been used post war to provide housing in Belfast. In 1993 the work moved to a new purpose built facility at its present location just one mile from where it began on the Edinticullo Road (just a few yards off the Dromara – Hillsborough Road). The work consists of a bi weekly After Church Rally, Saturday Morning Club for children and youth, Weekly Prayer Meeting each Monday night and a very successful ladies group which meets informally on a frequent basis throughout the year. In addition there are frequent Missionary, Teaching and Gospel Outreach events held.